This much we can stipulate: President John F. Kennedy was assassinated on Nov. 22, 1963, struck by two bullets  one in the head, one in the neck  while riding in an open-topped limo through Dealey Plaza in Dallas. Lee Harvey Oswald was charged with killing him, and a presidential commission headed by Chief Justice Earl Warren found that Oswald acted alone. That conclusion hasn't passed muster with the public. 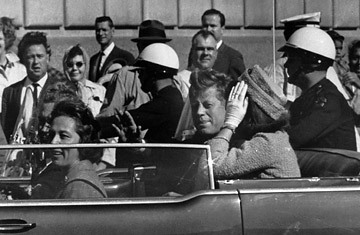 A 2003 ABC News poll found that 70% of Americans believe Kennedy's death was the result of a broader plot. The trajectory of the bullets, some say, didn't square with Oswald's perch on the sixth floor of the Texas School Book Depository. Others suggest a second gunman  perhaps on the grassy knoll of Dealey Plaza  participated in the shooting. Others believe in an even broader conspiracy. Was Kennedy killed by CIA agents acting either out of anger over the Bay of Pigs or at the behest of Vice President Lyndon Johnson? By KGB operatives? Mobsters mad at Kennedy's brother for initiating the prosecution of organized crime rings? Speculation over one of history's most famous political assassinations is such a popular parlor game that most people have taken the rumors to heart: just 32% of those polled by ABC believe Oswald carried out the killing on his own. Read "The Grassy Knoll Is Back."